In a nutshell: The X-Men fight Factor Three in an attempt to stave off World War III. (Main Story) The X-Men manage to escape from Factor Three's base by absconded in two Magno Disk, only moments before the entire facility explodes. The X-Men head back to the mansion to try and find a way to intercept Factor Three. Elsewhere, Mutant Master orders Changeling to contact the other members of Factor Three for an update. 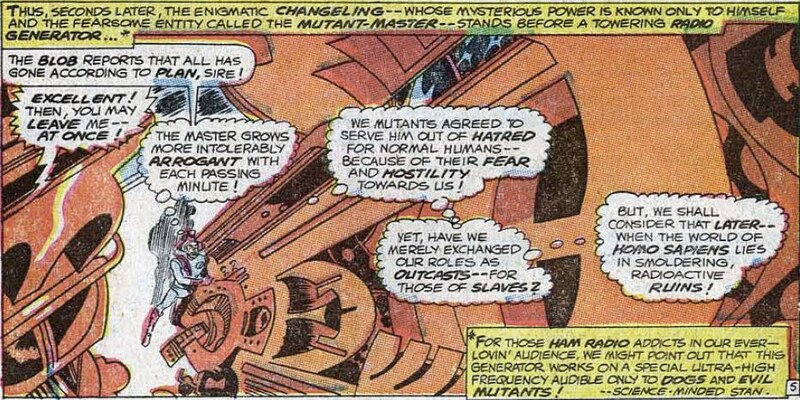 At the mansion, the Cerebro picks up that transmission and the X-Men split up in order to foil both plots. Angel, Beast and Marvel Girl journey behind the Iron Curtain to stop a bomb from killing Communist military leaders and encounter Blob and Vanisher. Meanwhile, Cyclops and Iceman visit a US Army base, vainly trying to convince the officials that Factor Three is targeting their missiles. Unable to convince the army, Cyclops claims he must then destroy every missile before Factor Three can use them. Back in Eastern Europe, the other X-Men manage to defeat Blob and Vanisher, but Vanisher escapes just as the other mutants are overwhelmed by Communist forces. Captured, they are helpless to stop the pending explosion. (Backup Story) A few years before forming the X-Men, Professor Xavier learns of an FBI investigation into the mutant phenomenon spreading around the country. 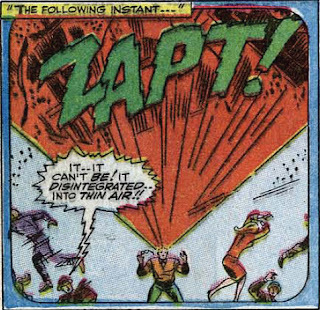 This causes Xavier to break his self-imposed exile and take the plight of mutants into his own hands. He meets with the FBI agent assigned to the mutant case and his partner introduces himself while demonstrating his power. Professor X points out that mutants can be both good and bad, and that, as a fellow mutant, he's in a better position to approach them than the FBI. The three agree to work together. As suggested by the duel plot summaries, this issue features a five page backup story. This is the first entry in the ongoing backup series "The Origins of the X-Men". The series is intended to establish the origins of Cyclops, Iceman, Beast and Angel, what they did before they came to Xavier's school and how they attracted Professor X's attention (Marvel Girl doesn't get one ostensibly because she was seen arriving at the school in X-Men #1, which is a bit of a copout). 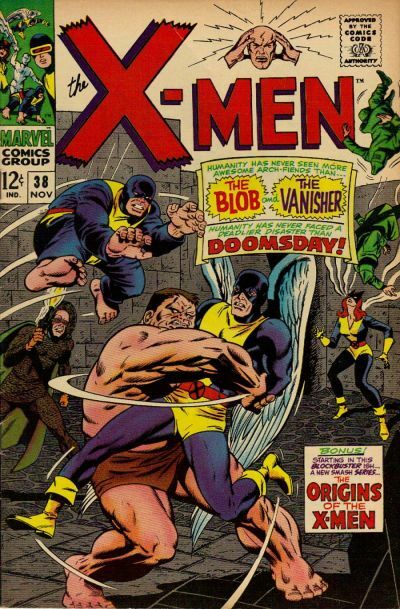 As we'll see, most of these backup origin stories are fairly episodic and pedestrian, and while they are largely forgotten and rarely reprinted (when these issues were reprinted during the titles early 70s hiatus, the backups were left out), the events depicted are still considered canon (the Marvel Handbooks, for example, still cite them). 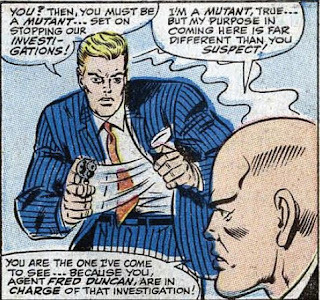 FBI Agent Fred Duncan, whose first and last appearance was X-Men #2 (when it was established he had a working relationship with Xavier), appears in the backup, showing the genesis of his partnership with Professor X. He'll pop up again in the main story soon. Don Heck, who inked Ross Andru last issue, fills in as penciller, while Werner Roth returns to draw the backup story. 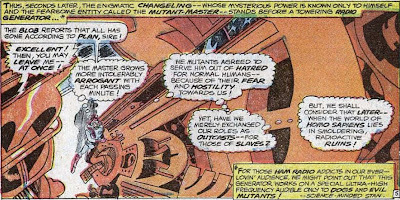 Changeling is starting to realize that Mutant Master is a bit mad, and that perhaps triggering a global nuclear war isn't in the best interests of mutants. In the backup, Xavier says that he's been a recluse since his step-brother Cain (Juggernaut) was trapped in the cave-in in Korea. 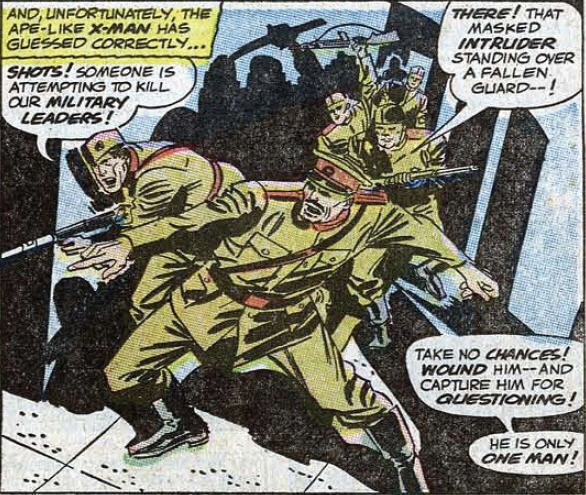 Putting aside several subsequent stories which contradict this, it was just plain wrong when this story was originally published, considering it had already been established in previous issues that Xavier traveled the world and fought Lucifer (losing the use of his legs in the process) in the time between leaving Juggernaut in Korea and founding the X-Men. 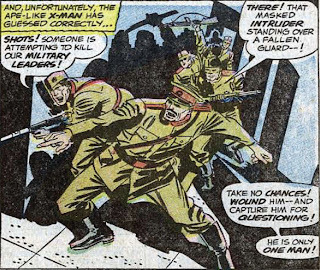 The X-Men fight behind the Iron Curtain. It looks about like what you'd expect, Comrade. Last issue it was the Oblivio-Ray. This time, Changeling uses a Predicto-Scope to show a captive Professor X the post-apocalyptic world Factor Three is working to create (apparently, the world of 60s super villains and the world of Harry Potter have a lot in common). Marvel's "sliding timeline" is already on display in the backup, as the events are said to take place in the "middle 1960s" (as opposed to the early 1960s, if time in the narrative was passing the same as in the real world). Before databases filled with information there was row after row of file cabinets. In the backup story, news reports of Cyclops power triggers anti-mutant sentiment amongst the populace, triggering the FBI into launching an investigation into the mutant phenomena and Xavier into forging an alliance with them while starting to recruit his X-Men. In the backup, a young Cyclops loses control of his power, causing an air-conditioning unit to plummet towards a crowd below, but he manages to use his power to destroy it before anyone is hurt. The crowd still freaks out. Teebore's TakeThe backup takes five pages away from the main story, making the obligatory "second chapter in a three part story where the heroes fight the villains but don't win yet" plot of the main story less tedious and more concise. As for the backup, well, the whole concept is a bit silly, considering Stan Lee allegedly came up with the idea of mutants (super heroes that are just born with their powers) because he was tired of having to come up with original origins for every new character he introduced. Now, four years later, Roy Thomas begins the process of establishing "origins" for the X-Men. Awesome post. I really enjoy Teebore's Take at the end of the post. I was reading the third installment of Kelley Armstrong's Darkest Powers trilogy this weekend. This is teen fic, and definitely for girls. 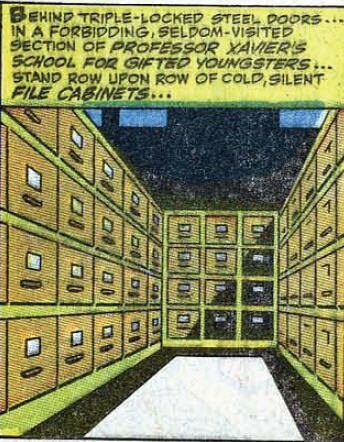 But, at one point in the novel, Armstrong sneaks in a reference to Charles Xavier's School for the Gifted. Even though I don't read X-Men, I love reading your reviews. They entertain me, I tell you!! i'm gonna tell you, straight up, that if i could be a mutant AND go to Hogwarts, well that would be the sauce. Throw in some jedi powers and some bending and that'd be all i need. unless in this world Buffy lives in Sunnydale. Thanks Jenn! Yeah, I definitely think the X-Men movies (and their relative popularity) helped bring them to the attention of a wider audience outside of comic book circles. And thank you, Palindrome. Glad you like them. I enjoy writing them (and, usually, reading the comics again before writing them); I wish I could write more, faster. @Falen if i could be a mutant AND go to Hogwarts, well that would be the sauce. I'm pretty sure that would just make you a god. @Falen: You forgot owning a holodeck...but then again, once you get a holodeck, who needs anything else? 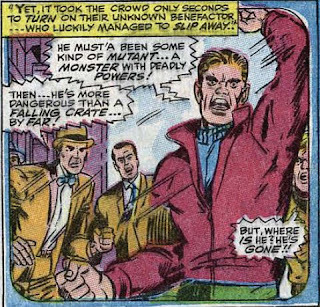 I love this caption in the second panel you reprinted: ""For those ham-radio addicts in our ever-lovin' audience, we might point out that this generator works on a special ultra-high frequency audible only to dogs and evil mutants! -- Science-Minded Stan"
Apparently Roy (who almost certainly really wrote the caption) felt it was a plot point that needed explaining, no matter how goofily. As for the backup, well, the whole concept is a bit silly, considering Stan Lee allegedly came up with the idea of mutants ... because he was tired of having to come up with original origins for every new character he introduced. Now, four years later, Roy Thomas begins the process of establishing "origins" for the X-Men. To be fair, though, there are "origins' in the sense of "how were the powers [or gadgets or mystic items, etc.] acquired" and "origins' in the sense of "what shaped these characters' lives in such a way that they decided to become costumed crimefighters or criminals". Whether or not the stories were any good is certainly open for debate, but the X-Men-to-be did have lives before entering Xavier's orbit, and it was only a matter of time before they got fleshed out. Oops! I forgot to subsribe — and in the bargain got a better verification word than "cghtsks". VW: venosag — The cold, hard fact that even Aphrodite (and her Roman counterpart) will succumb to gravity with age. it was a plot point that needed explaining, no matter how goofily. I LOVE how shameless old comics are about addressing plot points via captions like that. Ha! Yeah, isn't it amazing how Reed Richards could come up with costumes made of unstable molecules, but got totally skunked when it came to inventing the cell phone? the X-Men-to-be did have lives before entering Xavier's orbit, and it was only a matter of time before they got fleshed out. That's a fair point. They aren't "origins" in the sense of "how they got their powers", after all. @Blam And — I say this with great affection — Roy Thomas never met a plot point that didn't need explaining. Boy, you are not kidding. Roy is often credited as being one of the first "comic fan turned pro" and that never shows more than in his love of explaining away obscure and minor plot points. "For those ham-radio addicts in our ever-lovin' audience, we might point out that this generator works on a special ultra-high frequency audible only to dogs and evil mutants! -- Science-Minded Stan"
Does this mean that all evil mutants are dogs, or that all dogs are evil mutants? You decide, true believer! "Then...he's more dangerous than a falling crate... by far!" Does this mean that all evil mutants are dogs, or that all dogs are evil mutants? Then...he's more dangerous than a falling crate... by far!" (I got an error attempting to post this earlier, so if this is double-posted, that will be why).